No. 17 Kentucky (8-3, No. 15 CFP) at Louisville (2-9), 7 p.m. EST (ESPN2). Series record: Series tied at 15. The winner claims the Governor’s Cup and Bluegrass bragging rights. Having secured a third consecutive bowl berth, the Wildcats seek their most regular-season wins since 1977 and second series victory in three years. The Cardinals seek to end an eight-game losing streak with their seventh series win in eight meetings. Kentucky RB Benny Snell Jr. vs. Louisville’s run defense. The junior has surpassed 1,000 yards rushing for the third consecutive season (1,205, second in the SEC) and is 207 away from breaking Sonny Collins’ school record of 3,835 from 1972-75. Snell rushed for 211 yards on 29 carries last year in Lexington and will face a unit that ranks 125th nationally at 271.6 yards allowed per game. Kentucky: LB Josh Allen. The senior posted a career-best 15 tackles, including two critical sacks late to preserve the Wildcats’ 34-23 win over Middle Tennessee. In the process he broke school sack records for a single season (13) and career (27½). Allen could pad his numbers even more against an offense that has yielded an ACC-worst 41 sacks this season. Louisville: QB Malik Cunningham. Whether he or Jawon Pass start will be a game-time decision, but the redshirt freshman leads the Cardinals with 408 yards rushing, including 100 on eight carries in last week’s loss to N.C. State. He and 2016 Heisman Trophy winner Lamar Jackson are the only QBs in school history to rush for at least 100 yards twice. Jackson did it 23 times. 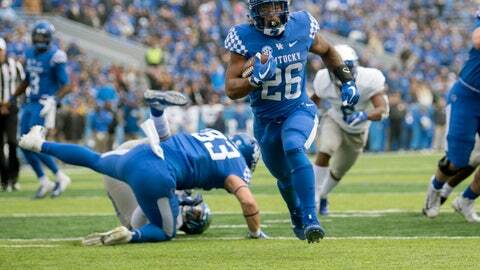 Snell is Kentucky’s career leader in rushing and total TDs with 44. … The Wildcats rank 12th nationally in scoring defense (16.8 points per game) and 24th in total defense (328.2 yards). … Louisville will say goodbye to 11 seniors who have gone 27-23 and reached three bowl games in their careers. … The Cardinals are coming off a 52-10 loss to North Carolina State, the sixth time this season it has allowed at least 50 points. … The game marks the second for Cardinals interim coach Lorenzo Ward, who took over when Bobby Petrino was fired on Nov. 11.